Being a premium Johnson County roofing contractor, we offer inspections to see if you’ll need a new roof for your Johnson County home. If you need a new roof in Johnson County we’ll come and give you an honest estimate and make sure that you understand how long it will take and how much it will cost for your new roof. All of the projects that we begin, the overall objective is to give the homeowner a safe and long lasting new roof. We are a premium Johnson County roofing contractor for many Johnson County residents and home builders simply because of our competitive prices and quality materials. Often homeowners insurance will cover the cost of your roof repairs or a new roof when your Johnson County home takes on major damage. However, you can be responsible for the entire new roof cost though. If you don’t know the cost of a new roof for your johnson county home and you think it needs to be repaired, please call us first before calling the insurance. We can save you the headache of having to file a claim if it’s not necessary. What Are Some Signs You’ll Need a New Roof? 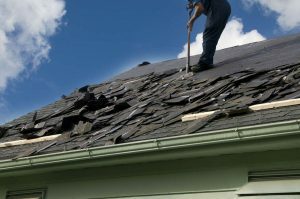 If you’re not sure if you need a new roof then here’s a list of signs you can check yourself to see if you’ll be needing a new roof in Johnson County. Your roof’s shingles are bending or curling. Your roof’s 25th birthday is coming up soon. Whole shingles are gone or missing. You can visibly see shingles are cracked. You can see sunlight from your crawl space or attic. You can see moss or algae on some of your shingles. The entire roof is sagging. You are finding small compact particles of a substance (often the shingle material) in the gutter.